A varistor is a voltage dependent resistor (VDR). 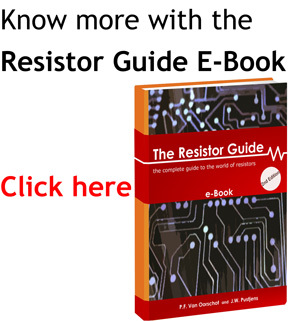 The resistance of a varistor is variable and depends on the voltage applied. The word is composed of parts of the words “variable resistor”. Their resistance decreases when the voltage increases. In case of excessive voltage increases, their resistance drops dramatically. This behavior makes them suitable to protect circuits during voltage surges. Causes of a surge can include lightning strikes and electrostatic discharges. The most common type of VDR is the metal oxide varistor or MOV. Varistors are nonlinear two-element semiconductors that drop in resistance as voltage increases. Voltage dependent resistors are often used as surge suppressors for sensitive circuits. Here are some examples of different packages which are often encountered. The block packages are used for higher power ratings. A voltage dependent resistor has a nonlinear varying resistance, dependent on the voltage applied. The impedance is high under nominal load conditions, but will sharply decrease to a low value when a voltage threshold, the breakdown voltage, is exceeded. They are often used to protect circuits against excessive transient voltages. When the circuit is exposed to a high voltage transient, the varistor starts to conduct and clamps the transient voltage to a safe level. The energy of the incoming surge is partially conducted and partially absorbed, protecting the circuit. 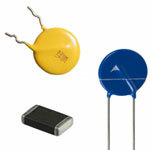 The most common type is the MOV, or metal oxide varistor. They are constructed of a sintered matrix of zinc oxide (ZnO) grains. The grain boundaries provide P-N junction semiconductor characteristics, similar to a diode junction. The matrix of randomly oriented grains can be compared to a large network of diodes in series and parallel. When a low voltage is applied, only very little current flows, caused by the reverse leakage through the junctions. However when a high voltage is applied, which exceeds the breakdown-voltage, the junctions experience an avalanche breakdown and a large current can flow. This behavior results in the nonlinear current-voltage characteristics. The term α describes the degree of non-linearity. 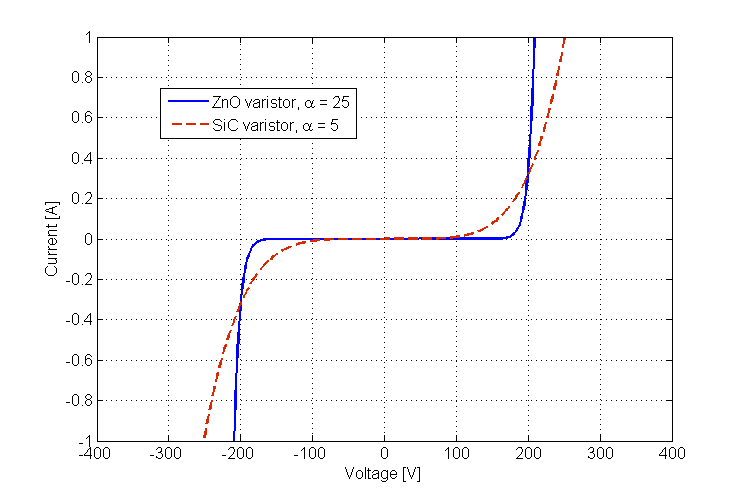 Figure 1 shows the characteristic curves of a MOV(high α) and SiC varistor(low α). Important selection parameters are the clamping voltage, peak current, maximum pulse energy, rated AC/DC voltage and standby current. When used on communications lines, the stray capacitance is also an important parameter. A high capacitance can act as a filter for high frequency signals or induce crosstalk, limiting the available bandwidth of the communications line. Varistors are useful for short duration protection in case of high transient voltage surges in the order of 1-1000 microseconds. They are however not suited to handle sustained surges. If a transient pulse energy in joules (J) is too high and significantly exceeds the absolute maximum ratings, they can melt, burn or explode. MOVs degrade when exposed to repeated surges. After each surge the MOVs clamping voltage moves a little lower, how much depends on the joule rating of the MOV in relation to the pulse. As the clamping voltage falls lower and lower, a possible failure mode is a partial or complete short circuit, when the clamping voltage falls below the protected line voltage. This situation could lead to a fire hazard. To prevent fire hazards, they are often connected in series with a thermal fuse which disconnects the MOV in case of overheating. To limit the degradation, it is advisable to use an as high clamping-voltage as the protected circuit allows, to limit the amount of exposure to surges. Silicon carbide varistor – At one time this was the most common type before the MOV came into the market. These components utilize silicon carbide (SiC). They have been intensively used in high power, high voltage applications. The disadvantage of these devices is that they draw a significant standby current, therefore a series gap is required to limit the standby power consumption. Selenium cells – These suppressors use selenium rectifiers allowing a high-energy reverse breakdown current. Some selenium cells have seal-healing properties that allow them to withstand high-energy discharges. They however do not have the clamping ability of modern MOVs. Zener diodes – A transient suppression device that utilizes silicon rectifier technology. They have a very constant voltage clamp ability. The major drawback of these components is that they have a limited energy dissipation capability. Gas discharge tube (GDT) or spark gap – These devices conduct after a conducting spark is created, the disadvantage is that they take a relative long time to trigger, the advantage is the large current carrying capabilities. Thyristor surge protection device (TSPD) – have similar characteristics as a GDT, but can act much faster. The following symbol is used for a varistor. It is depicted as a variable resistor which is dependent on voltage, U.